Optei por trazer a de cheiro a coco, tem muito a ver com a praia, férias, Verão e fica a cheirar tão bem...que após colocar e passado ainda algum tempo dizem por onde passo: "cheira a coco". É delicioso!Este está nos best sellers da marca. This rich and creamy Body Butter is a feast for the skin. It melts straight in to leave skin feeling soft and smooth. 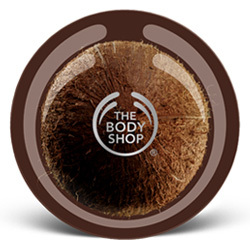 It contains Community Fair Trade virgin organic coconut oil and has a totally tropical coconut scent. 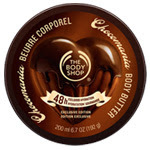 This decadently chocolatey Body Butter gives extra long-lasting hydration. It contains 13 Community Fair Trade ingredients – the most we’ve ever put into one product. It leaves skin sweetly scented, and feeling softer and smoother.